R5, Rozzi Crane, People Wearing Red Chucks, Bow Wow, Nicky, Ricky, Dicky & Dawn, YG, Guys Wearing Red Chucks, Sabrina Carpenter, Mac Miller, Guys Wearing Black Chucks, Guys Wearing Optical White Chucks, Cobra Kai, Coolest Chucks Moments in Film, Jessie Reyez, 2018 Black High Top Chucks, 2018 Maroon High Top Chucks, Deep Blue High Top Chucks, Red Days Ahead High Top Chucks, Jessie Reyez, Graduates Wearing Chucks, Ariana Grande, SZA, Young Sheldon, Red Converse Chuck 70 Vintage Canvas High Tops, Allessia Cara, Chris Brown, Victoria Justice, Wordmark High Top Chucks, Red Stonewashed High Top Chucks, Lil Wayne, The Game, Zendaya, Vince Staples, Tyga, Kenrick Lamar, Ice Cube, Camilla Cabello, 2017 Core Red High Top Chucks, Golden State Warriors High Top Chucks, Sangria Waterproof Chuck Taylor Boots, Marvin the Martian High Top Chucks, YouTubers Wearing Chucks, Indigo High Top Chucks, Dark Atomic Teal High Top Chucks. All the Marbles, Sabrina Carpenter and Rowan Blanchard’s Forever Chuck Ad, Converse Advertisement, The Groundskeeper, La Vida Loca, Never Land, Sunnyside Drive. Go to the Videos and Short Films with Chucks page. New listings with an article: Deadly Class, Iron Fist, On My Block, The Temptations, Rise, Grown-ish, How I Met Your Mother, Mom, Parks and Recreation, Game of Silence, Stranger Things, Season 2, Greenhouse Academy, The Carmichael Show, Sha Na Na, Preacher, Friday Night Lights, Sun Records, Hunter Street, 13 Reasons Why, Drake & Josh, Riverdale. Other recent listings are: Catastrophe, Nicky, Ricky, Dicky & Dawn, Single Parents, Cobra Kai, Young Sheldon, Fargo, Goosebumps, Puzzle Play. Go to the Television Shows with Chucks Index Page. Here With Me, Hello, Anxiety, REEL IT IN, Swang, Please Me, Dirty Little Secret, That’s Not My Name, Take Me On, Sugar, We’re Goin’ Down, Blackjack, Song About You, Take It Off, Best Day Ever, One Sweet Love, Christmas Everyday, Good Form, Walk My Way, She’s Kinda Hot, Ric Flair, Trust My Lonely, Africa, Black Magic, Friends, Cruisin’ for a Bruisin’, Hollaback Girl, Lucky You, When Can I See You Again, Fatlip, Campfire, Side Effects, Brand New, High Top Shoes, I Love LA, Say Amen, Corner Store, 2002, Old Friends. Age of Summer, Wildlife, Under the Silver Lake, Un Viaje a la Luna, Wadjda, All These Small Moments, Happy Log, Different Drummers, The Bye Bye Man, Rockaway, Kin, The Loved Ones, The House With a Clock In Its Walls, Breaking Brooklyn, Jurassic World: Fallen Kingdom, Boarding School, Summer of 84, The House of Tomorrow, To All The Boys I Loved Before, Ready Player One, Robo-Dog: Airborne. New listings: Shazam! Giant Little Ones, God’s Not Dead, How to Be a Man, Beautiful Boy, Christmas Wonderland, Getting Even, Goosebumps 2, F.R.E.D.I., Lucas, Roma, Welcome to Germany, The Christmas Chronicles, A Christmas Prince: The Royal Wedding, Olli in der Unterwelt. Go to the Chuck Taylor in Films Index Page. 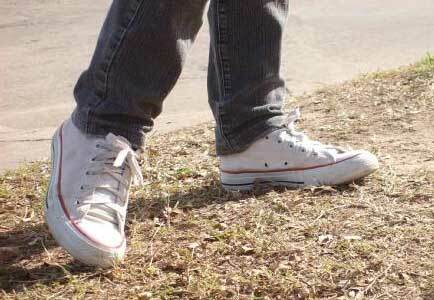 Chucks and the Hip-Hop Culture has been added to the Marketing Strategies for Chucks article. The first Shoe Outlook for 2019 is now online. The Chucks Sightings page, Chucks Appearances in Commercials and Unusual Places and the Core Chucks page have been updated. The Honor Roll for Actors Wearing Chucks in Films and Television Shows has been updated with the addition of Paul Rudd, Timothée Chalamet, Andrew Garfield, Jacob Buster, Evan Rachel Wood, Chris O’Donnell, and Brandon Tyler Russell. Go to the Articles about Chucks Index Page. Recently The ChucksConnection has upgraded our site to a new secured server with an SSL certificate so that you can be assured that all of our numerous site pages, articles, reviews, photo galleries, and other features are safe for your browsing pleasure. We have never stored any personal data on our website, even before this change, and all ecommerce transactions have always been conducted on secure pages monitored by our shopping cart and credit card affiliates. Now you can see that every page throughout The ChucksConnection website is secured with the lock symbol in the header. Pardon our dust if you have experienced any outages while we made the changeover. We hope you will continue to enjoy this website with all of its features about chucks and people wearing them, and as a resource for purchasing chucks and shoelaces to wear on them. Life is all about balance, and the new Chuck 70s Psy-Kicks provide that balance. The new chucks give a psychedelic spin to the classic Chuck ’70s with its unique yin-yang design for the classic Chuck Ttaylor logo. The pairs also come with yin-yang laces and a yin-yang outsole to represent balance. The new chucks come in low top and high top. The low top colorways are butter yellow and fresh yellow as well as Bleached Coral and Dusty Peach colorway and a Turf Orange and Melon Baller combination. The high top features an Aphid Green and Black combination, a black and white pair, and a wild lilac and black colorway. The colors for the high tops are much more subtle than the low tops and provides a light and simple color to an already unique shoe. The chucks run at a usual cost of $85 and combine a uniqueness to them with the spirit of summer that so many of us are ready to enjoy now. Let’s bring out some bright colors because spring is finally here. Spring is the time of the year to wear some colors that may not typically be in your wardrobe, and by that, it means any and all colors. Spring chucks should be any color, but importantly, solid colors. This is the time of the year to break out your Chuck Taylor All Stars or some Chuck 70’s that you’ve had for years and pair them with white, grey, and bright colors. 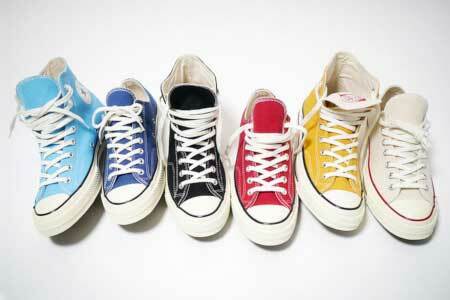 Solid red, green, yellow and blue chucks are perfect for spring. Of course, you don’t want to be wearing five different colors so make sure to know that a balance is vital. 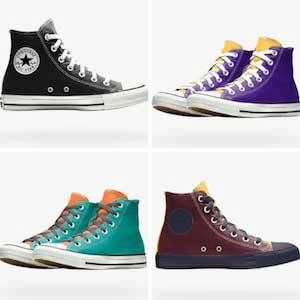 Converse Spring Chuck 70s Collection. Our advice for the spring is let the chucks have the spotlight and keep it cool with the shirt and jeans. 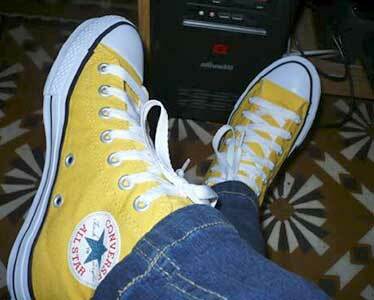 Green, yellow, and even purple chucks are not commonly seen, and spring is the time to wear them. This is also the time to wear tie-dye and pastel chucks, like the new chuck 70 beach dye model. If you’re looking to bring some unique colors to your spring, think about some of these colors: punch coral, icon violet, blue hero and a never fail choice, the create your own chuck. (You can create your own custom made chucks on the Converse website.) So, this spring, branch out a little bit from the average color and spice things up, it might bring a whole new positivity to your life. 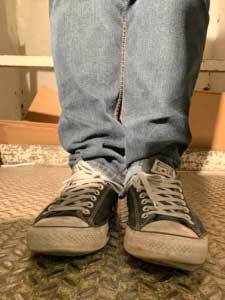 “I originally encountered chucks shortly after I turned thirteen. Several years earlier, my mom bought my older brother a pair of white low tops which didn’t fit him properly. Realizing that my shoe size had finally reached that of the shoes in question, my mom pulled them out of storage and offered them to me. Finally being offered my first fashionable shoe, I quickly slipped them on and wore them nigh exclusively for a whole month. After changing what I wore on my feet, my entire image of my own fashion changed and I became more confident in my style and presentation. A pair of chucks can change your sense of fashion. While most people ae good at picking out genuine pairs of chucks to wear when buying at a store or through a reputable online dealer, we often receive requests to identify pairs puchased at auctions or found on someone’s closet, or at a garage sale. The first way to make sure you are getting a genuine pair is to take a good close look at them. Do they look like real chucks or is something not quite right? Then look inside the tongues to see if there is a product label. All genuine pairs made since the mid-1990s will have that label. Knock off brands won’t have that label or the authentic heel patch or ankle patch on a high top or license plate logo on a low top. Does your high top have all these features? Just go through this check list to be sure. 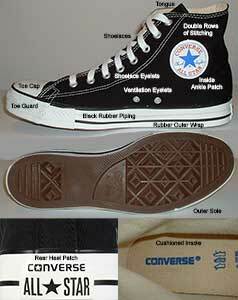 All the things you like about a genuine pair of chucks will be there, from the outer sole to the upper stitching. When you are buying a new pair of sneakers, don’t skimp and by a lesser knock-off brand. 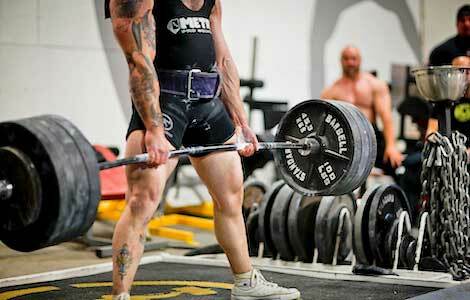 The few extra dollars you may pay are well worth it in both looks and endurance. 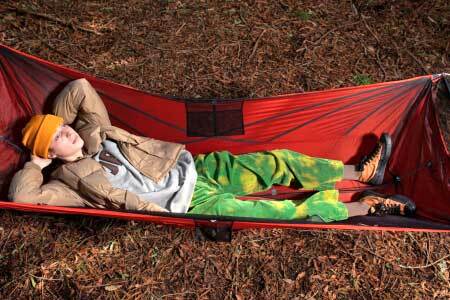 As spring quickly approaches, it’s time to ditch the heavy coats, turn off the heater and enjoy the outdoors again. Now there is a chuck to embrace the outdoors as Harlem rapper A$AP Nast of A$AP Mob has a new collaboration with Converse. 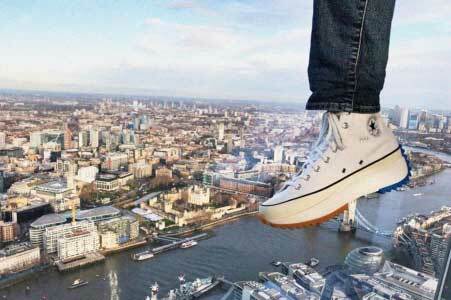 This isn’t the first collaboration between Converse and Nast. The pair unveiled a new One Star sneaker back in 2017. This time the “Trillmatic” rapper put his own spin on the class Jack Purcell Chukka, adding unique colorways and adding a mid profile instead of a low profile. The collaboration includes two different colorways. One colorway is called pumpkin spice, which is perfect for the spring as the leaves are still on the ground and the sneakers will blend right in. The other colorway is beechnut; the beechnut model is perfect for the weather and the ground because it blends perfectly with the color of bright spring grass. Both models embrace the spring weather and the look and feel of being outdoors. Guy lounging in Pumpkin Spice A$AP Nast Jack Purcell Chukka sneakers. A$AP Nast Jack Purcell Chukkas were released on March 22 and are currently going for $100. The new sneakers are just one part of the entire A$AP Nast x Converse collaboration, a collaboration that also includes sweatshirts, sweatpants, and t-shirts. Available online, and depending on your location, may be available at your nearest PacSun as well. The latest chucks to hit the market are to die for, or more accurately, to dye for with the new Chuck Taylor All Star Dip Dye. 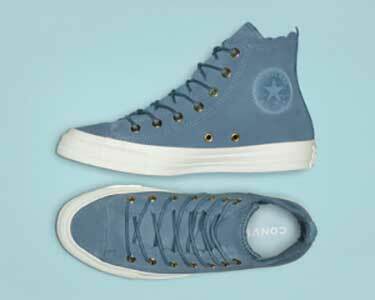 The new dip dye chucks come in both high tops and low tops. Both styles of chucks provide a unique colorway and style on an already classic look, fading the colors of each chuck from the toe to the tongue on the chucks. Both still have the classic aspects of the Chuck Taylor All-Stars such as the Chuck Taylor patch, lightweight canvas and the All-Star label on the tongue. and Mason Chuck Taylor All Star Dip Dye High Top. The high tops colorways include a pink foam to pink rise fade and a mouse to mason gray that gives the sneaker a cool steel or spraypaint look. When describing the high tops, the website has this statement, “Undisputed since 1917, the Converse Chuck Taylor All Star High Top shoe is the definitive sneaker. You already know the iconic details— a canvas upper, diamond outsole, and of course the Chuck Taylor ankle patch. Dipped and dyed in sun-drenched hues, an ombre upper remixes the original with varsity colors.” The low tops typically cost around $60 while the high tops generally are $65, so the costs leave fans with an ability to get one of the most unique chucks at a regular retail price. Japanese fashion designer Tomoaki Nagao, also known as NIGO, and founder of Bathing Ape and Billionaire Boys Club has collaborated with Converse to release a new Chuck ’70 series of high tops. 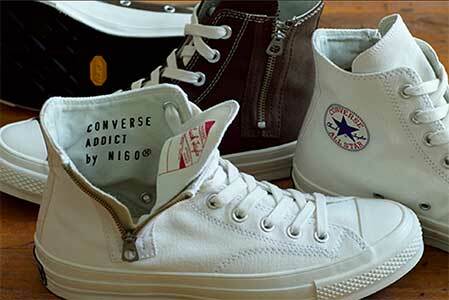 The new chucks are the NIGO Chuck Taylor All Star Zip Hi and are sold through the Japanese fashion-forward line, Addict. The chucks have a throwback feel to them with much of the influence and design from the 1960 Chuck Taylor All Stars, giving it a feeling of an old school basketball Chuck Taylor that you could see Wilt Chamberlin or Jerry West playing in. Like other Chuck ’70 models, these chucks have a “player’s name” tag you can fill in on the back of the tongue. The shoelaces, toe cap, heel label, stitching, and the upper reinforcement all have the look of the 1960s All Star chucks. Beige NIGO x Converse Addict high tops. The colorway of the chuck is beige and white. The upper canvas is beige and is suede which looks like it could blend into an NBA court from yesteryear or a modern court. The chucks have a complete white midsole, with a Vibram outsole, Poron insole, and a thermo-insulated Outlast lining, The top zipper entry is the standout feature of the chuck as NIGO gives a new, and creative spin on a classic look. The shoes also come in brown, white, black and camouflage models. White NIGO x Converse Addict high tops showing interior details; brown model in the background. The new NIGO x Converse Addict chucks will be released on April 10th and will only be available in Japan, and online. 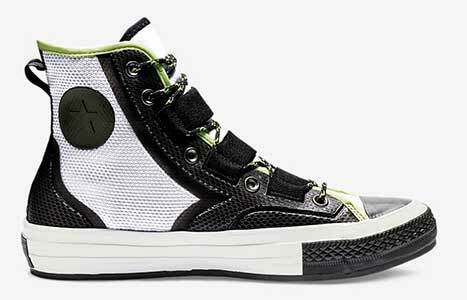 The new chuck will be highly expensive and highly coveted, being marked as ¥30,000, which is about $270. If you are interested in what Converse of Japan is doing, they have an app you can download for your iPhone. Converse has a new style of chucks with their Chuck Taylor All Star Frilly Thrills. The sneakers come in low and high tops and feature a frill edge and eye-popping colors to give a feminine look, making these chucks the perfect for a woman who wants a pair of chucks, but still wants to have a feminine flair to her shoes. The frilly thrills all feature a suede upper, soft foam sock liner, a unique scalloped edge, gold eyelet and a mono color tongue. The low tops come in pink foam, blue, egret, and field surplus. All of the pairs also feature a gold eyelet. There is the low top platforms, which have the gold eyelet and come in black, egret, and pink foam. With the platform feature, the chucks have double stacked rubber sole, giving it that platform look. The high tops pairs come in natural ivory, black and a unique celestial teal color that is clearly a different choice when comparing the low tops to high tops. Blue Chuck Taylor All Star Frilly Thrills high tops. Converse described the new release on their website: “A delicate balance of classic and chic, the Chuck Taylor All Star Frilly Thrills sneaker puts a feminine spin on a timeless silhouette. Featuring scalloped edges and premium suede in an understated color palette, these shoes are sure to brighten any outfit.” These chucks can be found at the Converse website, Macy’s website, and possibly at other store locations and sneaker selling websites. The price typically ranges from around $70-80 and come in women sizes. The sneaker features a white upper canvas with a colossal sole that looks not only like a hiking boot but a sneaker that found its way back home from the 1970s. The shoe looks as though it has enough traction to go up Mt. Everest. The sole is a combination of blue, white, and a butterscotch color to give it an old school feel with JW Anderson across the sole. 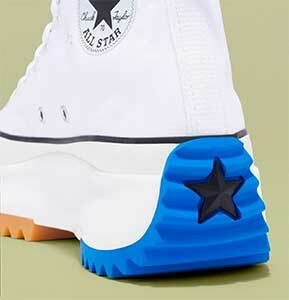 There is a single black star on the back of the heel, and the iconic All Star logo on the ankle is black and white with the number 70 below the star. Converse x J.W. Anderson Run Star Hike Chuck ‘70. The new Chuck ‘70 sneakers were released on February 12th, 2019 and are currently sold out on Converse.com, but may be available at other department stores. 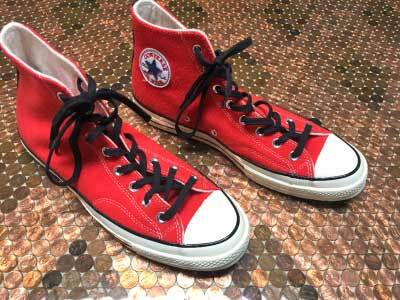 If you want to get your hands on these chucks, it will take some effort, but for many fans, it is well worth it. The plaid pair is a grey, green, black and red colored plaid pattern with a red translucent midsole, toe and ankle patch. The red, white and blue pair has a primarily white upper canvas on the sneaker with a red color heel patch. The sneakers feature a translucent blue midsole, toe, and then a blue tongue as well. The final pair is a black and white graphic upper canvas pattern with a black translucent midsole, toe, and ankle patch. 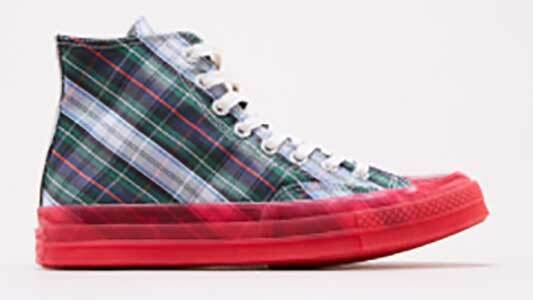 A new grey, green, black, and red plaid Chuck 70 Translucent Midsole High Top. All pairs come with the Chuck Taylor classic All Star patch on the heel like all chucks. The new pairs of chucks can be found on the Converse website, or Urban Outfitters or other retailers. Each pair costs around $120, so these pairs are going to be a bit harder to afford. One of the new pairs has a fully covered upper African pattern, with colors of teals, yellow, pink and black. The pair has a black, glossy midsole with the same color for the toe with a yellow outsole. The pair also has a ‘BHM’ emblem on the top of the tongue. The other pair contains African pattern patchwork on the heel, collar, and toe with the rest of the upper canvas being a solid black color. It has a white midsole with a yellow outsole. Both sneakers feature the classic Converse symbol that is known with chucks. 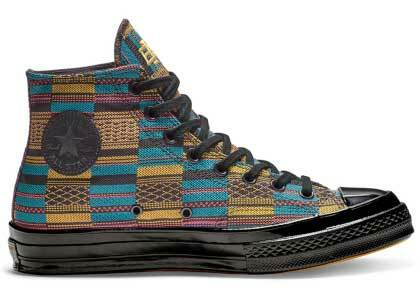 Chuck Taylor 70 BHM Patchwork High Top. These pairs of chucks are a part of the larger Black History Month collection that Nike unveiled that also featured Nike Kyrie “BHM,” Nike LeBron 16 “Equality,” and Nike PG 3 “BHM,” among many other sneakers. These sneakers were released on January 21st, and go for around $100. Valentine’s Day is coming up, which means it is time to get a loved one a gift to show your love. What is better than a pair of chucks? Luckily, Converse has their own Valentine’s Day collection. If you are looking for something a bit different for this holiday, there are the white Chuck Taylor All Star fringe leather high tops. It indeed is a statement chuck and is the most unique out of the Valentine’s Day collection. One of the other All Star pairs is has an iridescent black look, and the last pair is a red monochromatic low top chuck. Each pair also has a gold metallic heart pendant. 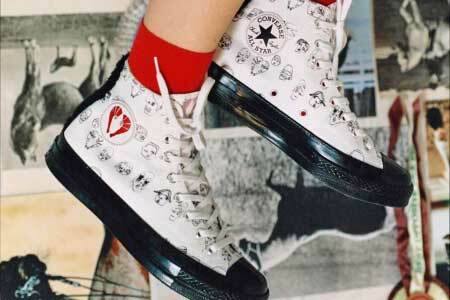 A perfect pair would also one of the Converse x Play Comme des Garcons Chuck Taylor All Star high tops. It is one of the most popular collaboration chucks in recent memory, and we have covered the pairs previously on the site. The pairs are an off-white color with the signature Comme des Garcons heart logo which makes perfect sense for Valentine’s Day, while the other pairs are black and white and black polka dot pair. It is a perfect pair if you want something for Valentine’s day, but also a high end, favorite sneaker. If you want to go more of a traditional style, a perfect pair would be either a core red or pink Chuck Taylor All Star, in high tops or low tops. For any chucks fans, it’s no secret that chucks are not for one specific group or culture. Part of the popularity of the sneakers is the amount of acceptance they have throughout cultures, style, and people. The Chuck Taylor All Star (the first chucks) was initially designed to be a basketball shoe, but now is typically viewed as a leisure and everyday wear shoe. No matter if you associate the sneakers with basketball, punk music or a child, chucks are meant for everyone. Maybe that’s one of the reasons why Chuck Taylor All Stars were Instagram’s fifth most shared shoes. 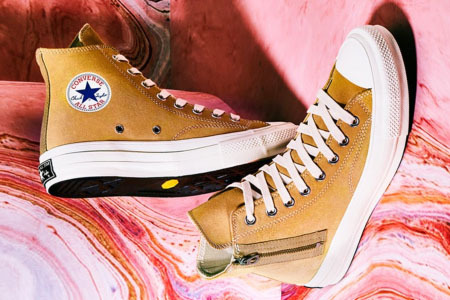 There are four new chucks for 2019, with vibrant and unique colors that will surely be a match for chuck lovers, especially for women. Two of the new seasonal Chuck Taylor All Stars are high tops, coming in Bold Citron and Moody Purple colors. The Bold Citron offers a unique color that is more mustard than lemon. The color will pair well with black clothing better than a brighter yellow would. The Moody Purple color is less vibrant and more subtle, giving an almost grape look to them, and can match with complementary outfits. Moody Purple and Bold Citron high tops, Teal Tint and Pink Foam low tops. 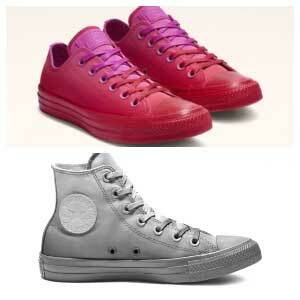 The other two models are Chuck Taylor All Star low tops in Teal Tint and Pink Foam. These chucks have a more subdued and faded look to them that should have good fan appeal. Both colors are good beach colors. The teal tint color is nearly a light blue. The pink foam color is perfect for younger people but is still great for older people who want a new color that makes a statement. 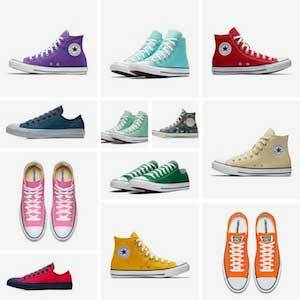 All these pairs of chucks have the same components that are commonly found with All Star high top and low top chucks, a padded insole, rubber toe cap, canvas upper and the Converse license plate logo on the heel of the shoe. 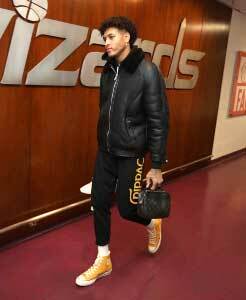 The high tops have single color ankle patches. The new pairs of chucks can be found through Converse’s website or local retailers like Tilly’s or Nordstrom, as well as many other online sites. The price should range from around $50-60. For other seasonal colors visit our shoe outlook page. Wearing chucks every day causes wear and tear to them no matter what, so even if your sneakers are taken care of, they will eventually deconstruct. 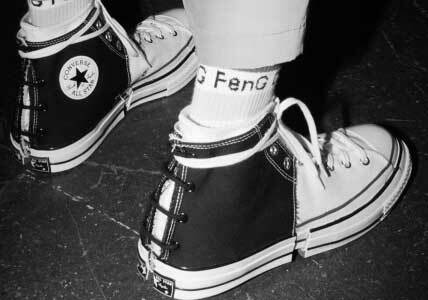 The new Feng Chen Wang and Converse collaboration are made to do just that, deconstruct. The new “My Half” collection designed by Feng Chen Wang was previewed at her Shanghai Fashion Week show. Without a doubt, the new chucks are one of the most creative and unique designs in recent sneaker memories. 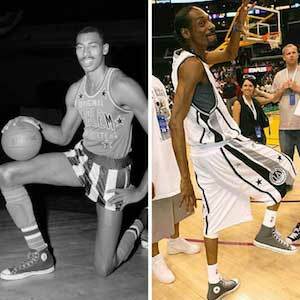 The collaboration will feature high top and low top versions of Chuck 70s sneakers with a new twist. New Black and White High Top “My Half” Chuck 70s. The low top versions will come with a functioning strap across tongue and laces, as well as an open back to give the look of a sandal. The pair come in a red/white, black/white, blue/white and all white colorways. One high top pair gives a rope lacing system in the back of the shoe at the heel with either a black, blue or military green half tied to a white chuck 70s sneakers to give the look of deconstruction. The other high top pair is a unique exoskeleton like canvas to give the appearance of deconstruction. The pair come in a pink/white, black/white, and green/white colorway. The pair also comes with a pair of Feng Chen Wang socks sown inside the sneaker. The new “My Half” chucks are set to be released sometime in 2019. We have started a new feature on The ChucksConnection that addresses videos and short films where actors wear chucks. These films are normally seen on websites like YouTube and Vimeo and made by amateur or aspiring filmmakers. Too short to be included on our Chuck Taylor in Films page and not released to the public through paid streaming, DVD or BlueRay, these videos and films are free for viewing, and we provide links to them on our new Videos and Short Films with Chucks page.